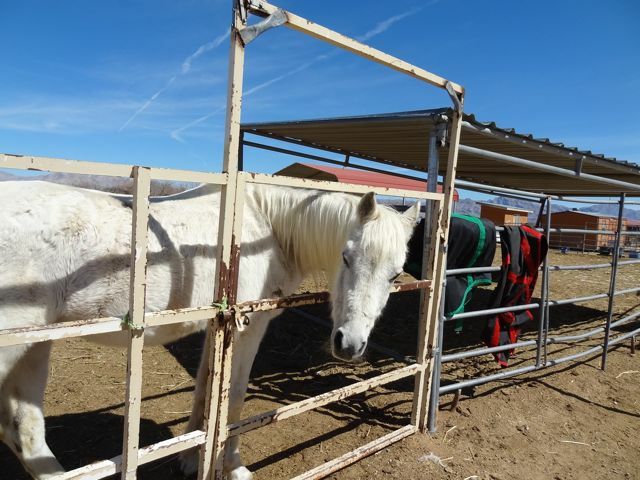 Thanks to Don’t Be Cruel supporters, we were able to sponsor a horse named Cloud from Nevada’s Shiloh Horse Rescue for the month of April. Located on 40 acres in Sandy Valley on the Nevada/California border, Shiloh Horse Rescue and Sanctuary is “a place of peace for horsed in need.” Co-founded and operated by Jill VandenBerg Curtis and mother, Sally VandenBerg, Shiloh is home to over 75 horses in addition to an array of other animals including several pigs, goats, two miniature burros, a llama, and an alpaca. 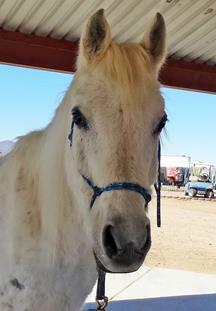 Cloud, a gorgeous grey 20-something gelding, was rescued from the Cedar City slaughter auction for $61! Fancy and feisty, Cloud was used for riding lessons where he taught kids how to jump. Sally, who loved his cute face and the fact that he was small and compact, began riding him for pleasure when he wasn’t doing lessons. When he began to develop soreness issues, probably due to advancing age, he was “retired” to one of the sanctuary pastures where he spends his days bossing the other horses around and begging for treats from visitors to the rescue. To see Cloud updates, check out his Facebook Photo Gallery. Don’t forget to “LIKE” the Shiloh Horse Rescue Facebook page for frequent updates on all their animals. Also, check out Shiloh’s Guardian Angel Gummies, a feed program for their old toothless horses who need extra care and nutrition. They’ve developed a sponsorship program to ensure that their senior horses’ remaining years are safe and comfortable. This entry was posted in Donations and tagged Cloud the horse, Jill VandenBerg Curtis, Sally VandenBerg, Shiloh Horse Rescue on March 27, 2013 by Belkis Cardona-Rivera.